In many ways, Martha’s Vineyard is a little world unto itself. Indeed, the 17,000 year-round residents like to say that they are “45 minutes from America,” citing the time it takes for the ferry to cross from Woods Hole. The topography is diverse, with a flat east coast rising to mid-island hills culminating in dramatic cliffs on the west coast. 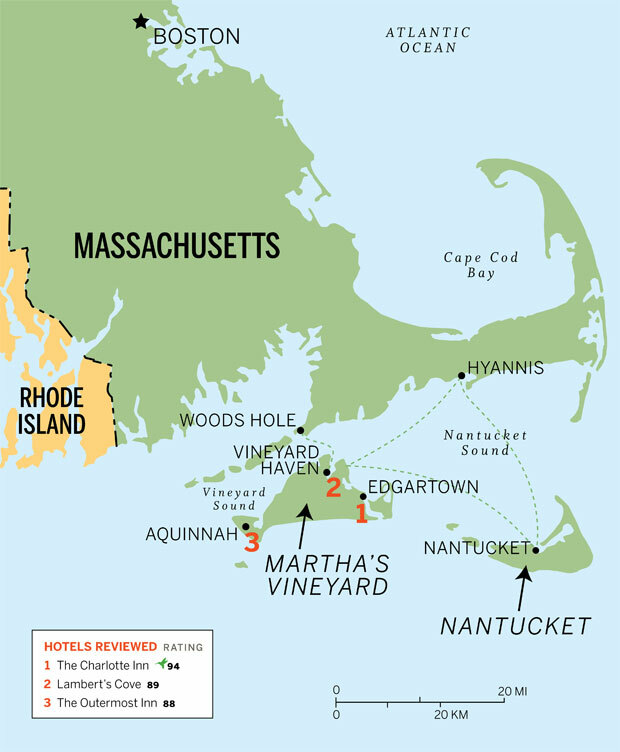 And, of course, the Vineyard is ringed by the beaches that draw an eclectic summer crowd. Edgartown is the quintessential New England port town, with a peaceful harbor, dignified white clapboard houses and tree-shaded lanes filled with appealing one-off shops, galleries, restaurants and cafés. My favorite place to stay has long been The Charlotte Inn. A short stroll from the town center, the inn embodies the elegance of a fine old country house. The interior is warm and welcoming, with fine woodwork and gleaming brass fixtures. The 19 accommodations fill the main house — which dates to 1866 — and adjacent period buildings. They come with 19th-century furniture, complemented by attractive fabrics and wallpapers. The large baths are modern, but are decorated in a traditional style. Exceptionally attractive public rooms are filled with judiciously arranged antiques, plus a fascinating array of prints and paintings. Set in a light-washed conservatory with adjacent outdoor space, The Terrace restaurant ranks as one of the island’s best. The menu is market-based, so changes regularly, but you can count on locally sourced dishes such as Katama Bay oysters and scallops with a bacon aioli; lobster bisque with crème fraîche; and fillet of swordfish dressed with a beurre blanc sauce. LIKE: While the setting may be formal, the tone is congenial and tranquil. DISLIKE: Some may object to the prohibition of the use of cell phones and computers in public areas. GOOD TO KNOW: The inn does not allow children under 14; parking is extremely limited. THE CHARLOTTE INN, Rating 94. Superior Room, $395-$795; Suite, $595-$1,200. 27 Summer Street, Edgartown. Tel. (508) 627-4751. Tucked away in a forested enclave on the island’s north shore, Lambert’s Cove stands at the end of a winding private drive. Originally a 1790 farmhouse, the inn is set on a seven-acre estate that includes a carriage house, a guesthouse, lush gardens and an inviting pool. The 15 rooms are divided among the three buildings. The sizes of the rooms vary, but all are large enough to be comfortable. We had been assigned to a modest suite, done in shades of cream and taupe. Its sitting room came with a small sofa, while the bedroom featured a canopied queen bed, a handsome dresser and a window- mounted air-conditioner that functioned with quiet efficiency. The attractive bath had a roomy walk-in shower, but no tub. Overall, our accommodations were pleasing, but not at the pinnacle of luxury. The public rooms in the main house earned our unqualified admiration, however, owing to their fine woodwork, Oriental carpets, well-chosen fabrics and antique furniture. The inviting library was especially hard to resist. At night, this becomes an extension of the dining room, itself a lovely space overlooking the garden and pool. This is unquestionably one of the best places to dine on Martha’s Vineyard, and our meal was faultless from start to finish. The kitchen focuses on local produce, and we enjoyed a simply but perfectly cooked fluke (summer flounder) with seasonal vegetables, and succulent chicken served with savory waffles. This was followed by a luscious strawberry-rhubarb crisp. The service was courteous and efficient. LIKE: Secluded setting; nice pool area. DISLIKE: The rooms are less impressive than the public areas. GOOD TO KNOW: The inn has a limited number of passes to nearby Lambert’s Cove Beach. LAMBERT’S COVE, Rating 89. Room, $250-$575 (Includes full breakfast in season). 90 Manaquayak Road, Vineyard Haven. Tel. (508) 693-2298. Past the town of West Tisbury, the Vineyard becomes much more rural, with cattle- and sheep-stocked fields, woodlands and pleasing vistas of saltwater ponds edging seaside dunes. Just a short drive from the landmark Gay Head Light, The Outermost Inn is clad in weather-grayed cedar shakes. 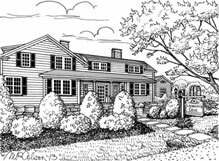 The main part of the inn served for many years as home to Hugh and Jeanne Taylor (part of the talented Taylor clan, longtime Vineyard residents, whose best-known member is singer James). In 1989, the Taylors restructured their home to create seven guest rooms. We stayed in “Beech,” which, like the others, is flooded with light off the sea. The furniture embodies Shaker simplicity, but is augmented by colorful rugs and local artwork. We enjoyed the amenity of a whirlpool tub tucked into an alcove; the bath itself came with a single vanity and walk-in shower. The public areas are delightful, relatively plain but with beckoning couches and many personal touches such as an eclectic mix of books, piles of board games, and works by local artists and artisans. At the end of the day, guests gather at the honor bar as a prelude to dinner in the lovely dining room with its beamed ceiling, massive fireplace and views out to the lighthouse. Many Vineyarders vote this their favorite restaurant, a status confirmed by the nightly wait list. Chef Scott Cummings sources as much as possible from the island and makes everything in- house. We savored the starter of lobster prepared two ways — butter-poached and in a rich bisque — and then relished the diver scallops with pork belly, chanterelles and corn purée. I concluded the meal with an outstanding blueberry-lemon parfait with vanilla foam and lavender shortbread. The Outermost Inn is one of those intriguing places that somehow manages to exceed the totality of its parts. Overall, it is a homey and unpretentious inn, which captures the character of the Vineyard’s west end. Those who prefer greater formality and more luxurious appointments should look elsewhere. But I suspect that some readers will fall for its considerable charm. LIKE: Spectacular setting; relaxed atmosphere. DISLIKE: Rooms, while comfortable, are a little bare bones in décor. GOOD TO KNOW: Children under 12 are not allowed; the inn has limited passes to local beaches. THE OUTERMOST INN, Rating 88. Room, $340-$430. 81 Lighthouse Road, Aquinnah. Tel. (508) 645-3511.